I’ve continued my exploration within ZBrush 3, and had a one hour doodling session today (I haven’t forgot about my other projects, updates will come shortly on those as well). But I am really falling in love with the intuitive way of working in ZBrush so I will continue investing time to really get confident with this package, so I can use it in many of my upcoming projects. The ZBrush doodle I posted yesterday was my first attempt to create something in zbrush 3, and was done with blocking out the shape with a sphere brush, convert it to a polymesh and then pull, push and drag around the clay from there. It got quite messy and lot’s of stretched and overlapping polygons. It’s almost impossible to control the topology working in that way. So today I improved my workflow in ZBrush and used zspheres instead and got into the habit of using them to create a much better base mesh to work from. Nice and controlled topology, much quicker to work with and which therefore also resulted in a much nicer result. From the zsphere created base mesh I made a few divisions to get the details I needed to sculpt out all the finer details. And from starting with an empty canvas to the creature I ended up took about an hour. 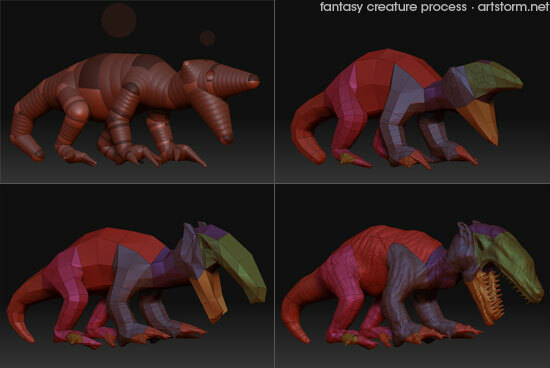 Amazing, this would have take so much longer to model and sculpt in a traditional 3D package. 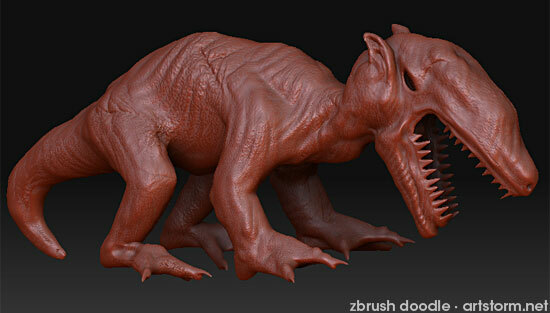 Can’t wait to continue getting deeper into zbrush and start exchanging data between LightWave 3D and ZBrush.